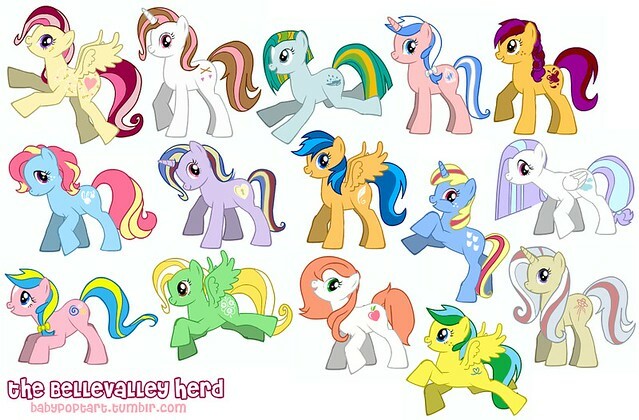 I used the FiM Pony Maker because it's so darn customizable but they're all ~~supposed~~ to be G1s. Lockette & Heartstrings I've posted here before but now I have an entire new herd. They were the lone survivors of my attempts to make a herd back in 2004 or 2005, but I have fifteen lovely ladies now. TOP: Lockette, Heartstrings, Puddle Jumper, Damsel, PB&J. MIDDLE: Honeybun, Chastity, Flyaway, Sugar Drops, Cloud Nine. BOTTOM: Folly, Whimsy, Pink Lady, Loophole, Antique. I'm practicing drawing ponies again, haven't drawn them in years and was never that good at it. Any future drawings of them will go in the Art forum, right? Or should I add them to this thread? Such nice looking ponies! They really look like they would fit in with G1. LOOOOOVE!!! I think Chastity, Whimsy, and Loophole are my faves, but they're all so stinkin' cute!!! Chastity, Antique, and Lockette are my favorites here, but their all so cute!